The mountain of lobster from Fishman Lobster Clubhouse has been beckoning me for years. 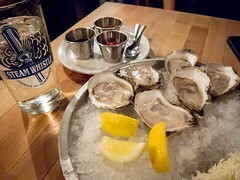 With shellfish allergies on both sides of our families though, The Hubby and I only visited recently. 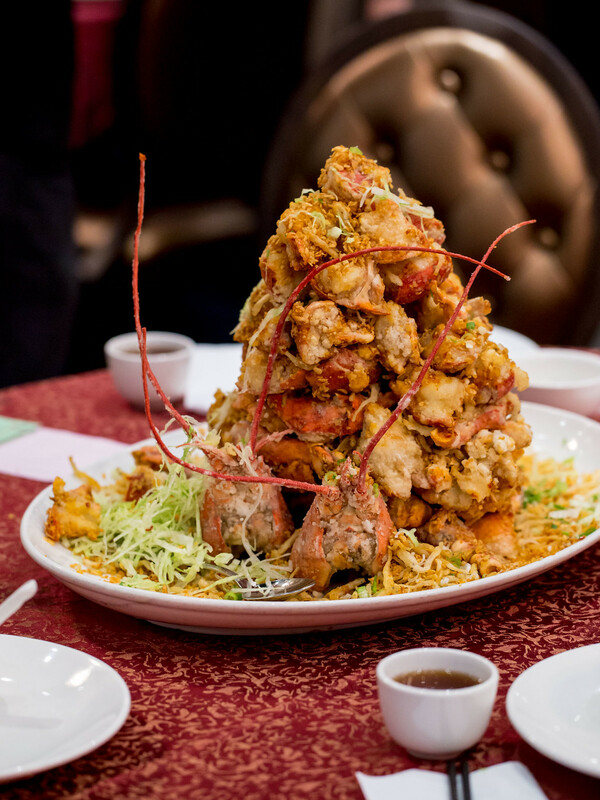 We were waiting for an occasion (really an excuse) to splurge a bit and to have a party large enough to justify ordering a big lobster mountain. In the end, we couldn’t hold off any longer and stopped by with just my in-laws to feast on 8lbs of lobster, for just the 4 of us. Atmosphere: Reservations at Fishman are hard to come by. The restaurant has two seatings per evening and tables book up weeks in advance for weekend dinners. Luckily, we were able to visit on a Monday and only had to book a week ahead. Even on a Monday, every seat was occupied for both seatings. There was an air of excitement in the restaurant as tables greeted their giant lobsters or crabs before the seafood was turned into dinner. A loud thud at the table behind us announced the arrival of their massive king crab. Flashes from cameras and posing, myself included, was a mandatory part of the meal. Service: The service at Fishman Lobster Clubhouse was conflicting. On one hand, servers and hosts constantly walked the dining room clearing empty plates and picking up any dropped napkins or shells. On the other, several servers ignored or forgot our requests for a missing dish and we ended up having to ask several people before our set course was complete. 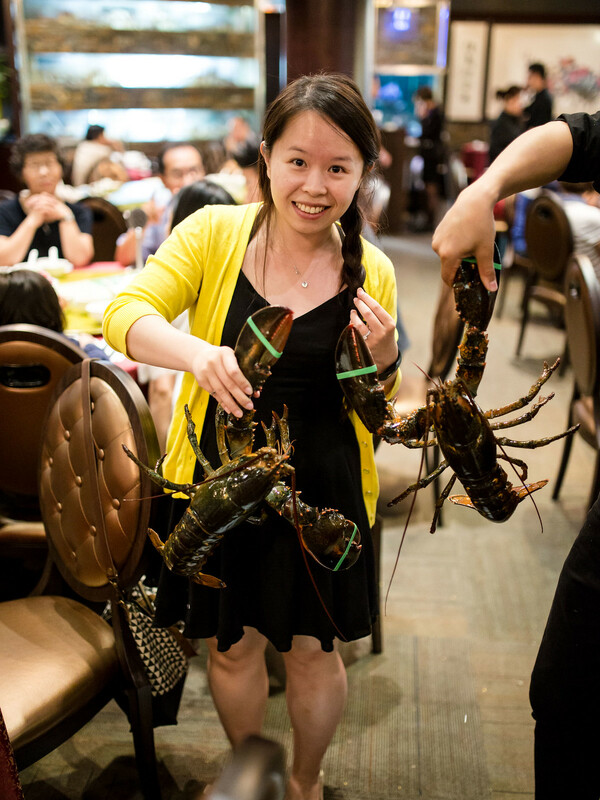 Servers waited patiently as diners snapped photos and held up lobsters to help with posing. But after that, the meal was a tightly wound production. 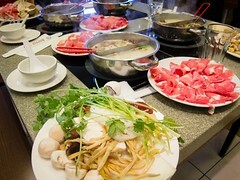 Dishes were cooked and served in batches, and dishes cleared quickly to make way for the next seating. 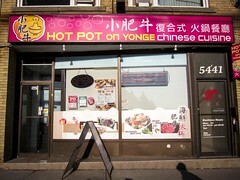 Food: Despite the service kerfuffle, I really enjoyed the food. To the point that I am looking for another excuse to return. The menu at Fishman consisted of set meals and a la carte items, with the set meals being a much better value. Each set included lobster, king crab, or both at a minimum weight and cooked in different ways. Customers could request larger crabs or lobsters at an extra charge per pound and pick a style of cooking. We decided to stick to just lobster that night and ordered a set for 4 people, upgrading the lobster to 8 lbs, cooked HK style. Once we placed our order, the server came by with the two lobsters that added up to our requested weight for us to ok them. 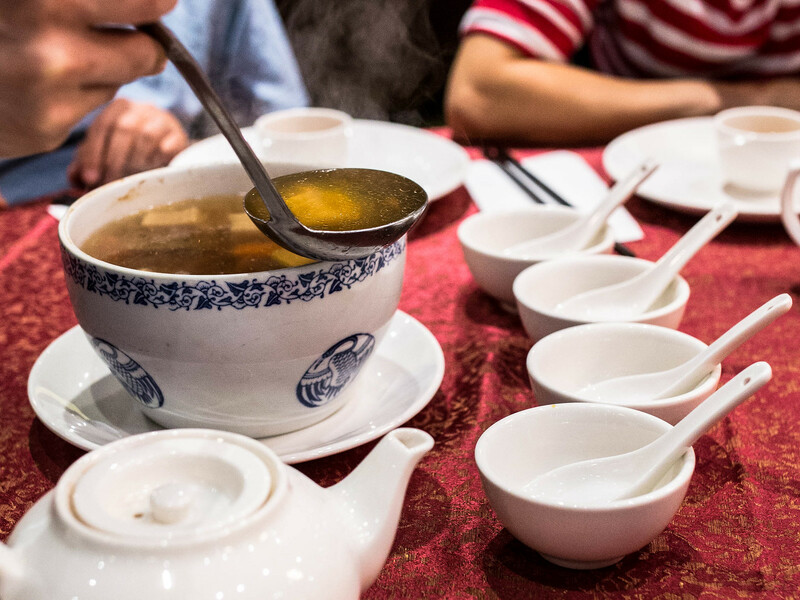 The first course was a clear soup that was savoury and simple. Nothing special, but a nice start to the meal. 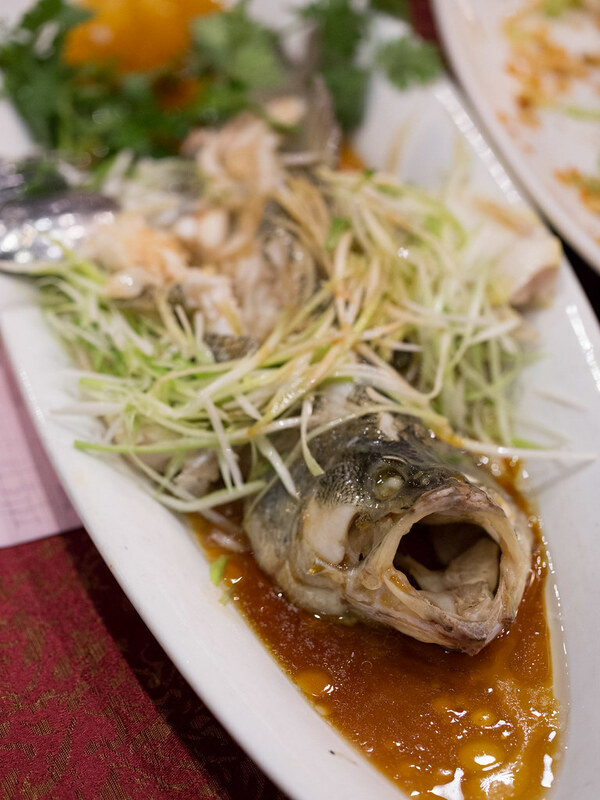 Aside from lobster, the other two dishes included in the set meal were a steamed sea bass and stir fried pea sprouts. I liked the light dressing on the sea bass and the fish was very tender, cooked to just when the flesh turned opaque. 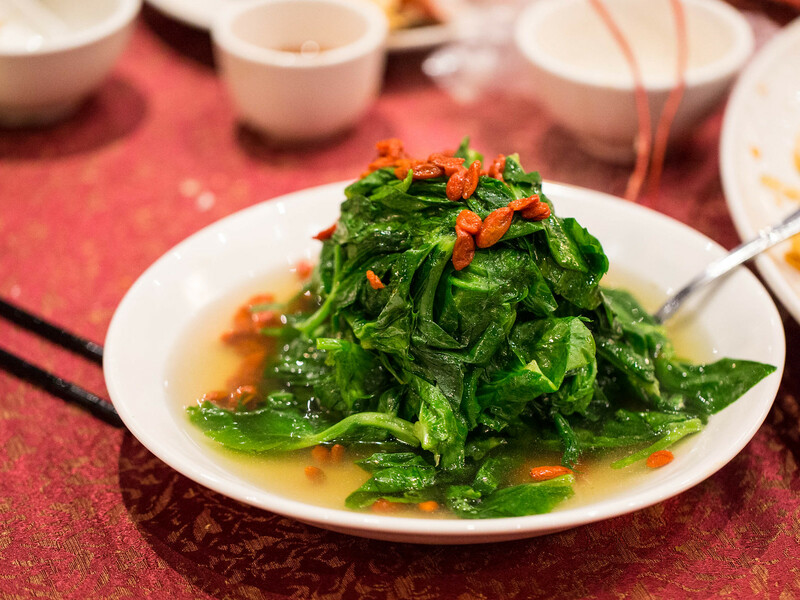 The pea sprouts were also tender, even the stems, and would have been a refreshing compliment to the deep fried lobster. Of course, the lobster mountain was the highlight and centerpiece of dinner. Both lobsters were cut into chunks and the shell expertly cracked for easy access to the meat. 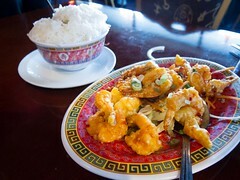 HK style meant each chunk was lightly battered, fried and seasoned. Given the size of the lobsters, I was impressed with how well they were cooked, keeping the meat incredibly tender, juicy and rich in flavour. Whenever we’ve tried cooking larger lobsters at home, the meat has turned out a bit tough. Not the case at Fishman. The lobster was excellent quality and the meat was sweet and tasty. The seasoning was heavy on salt and after eating 2 pounds, I was quite thirsty. Overall, dinner at Fishman Lobster Clubhouse was an experience I’d recommend to anyone who’s a fan of lobster. 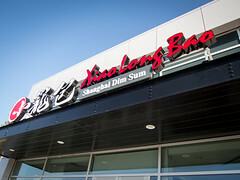 I liked how flexible and customizable the menu was and the quality seafood was delicious. Our final bill came to just over $200, a pretty good value for the volume of lobster.